A woodlander that can be found growing in our Californian Pinetum here at the Botanical Gardens. 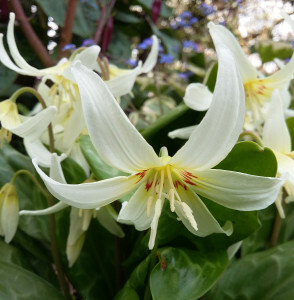 Erythronium californicum is a beauty producing white flowers above marbled foliage which are endemic to the wooded mountains of Northern California. More commonly known as the Dog’s tooth violet which refers to the bulb of Erythronium dens-canis which looks just like a dog’s canine tooth. Erythroniums are another plant that takes advantage of the tree canopy being less dense, flowering and dying down in a short space of time. They can be found growing in the wild right across the northern hemisphere, from North America to Japan. A truly delightful group of bulbs that should be grown in a shady border and be admired before it retreats underground until the same time next year.